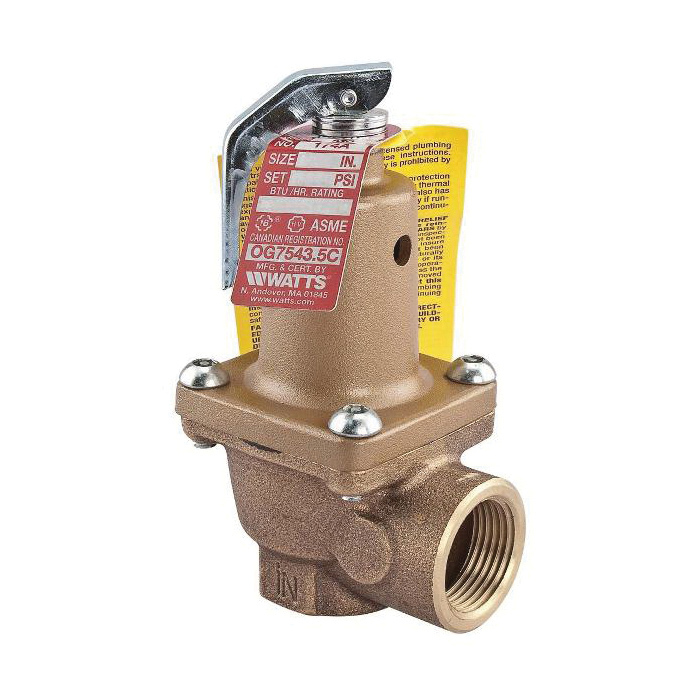 Series 174A Boiler Pressure Relief Valves are used in hot water heating and domestic supply boiler applications to protect against excessive pressures on all types of hot water heating supply boiler equipment. It consists of a bronze body construction with NPT threaded female inlet and NPT threaded female outlet (drain) connections, non-metallic disc-to-metal seating, stainless steel spring, and test lever. Series 174A resists corrosive water conditions, sticking and freezing, and prevents water and sediment from being trapped in the seat. It is designed for emergency safety relief and shall not be used as an operating control. Standard Pressure Setting: 30psi (206.9 kPa), Pressure Range: In 5psi (34.5 kPa) increments from 30 to 150psi (2 to 10 bar) with corresponding high ratings from 650,000 to 14,370,000 BTU/hr.